In present cars dominate our lives and cities. But how should they look like ten years in the future? E-cars will change the sound of the cities.Traffic jams everywhere? Science fictional ideas aren´t as far away as it seems to. 3D printing even nowadays is way cheaper, then to shoot stuff up the sky. Alongside pier to pier car sharing, which will be the next huge thing within the following years, autonomous mobility stays also on focus. 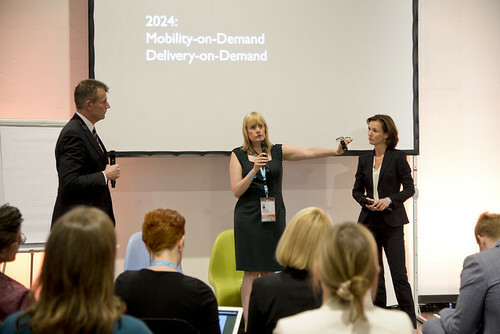 BMW corporates with sharing concern Sixt to combine these topics. A change of mobility and techniques stands ahead. But who will be faster? The government, or the economy? BMW as a company requires that the government integrate themselves more. We live in a world where we always save a backup, just in case that we could need it. A result of the big data will be that cars have an emergency button and sensors everywhere around in case of an accident, for fast and precise coming help. Technical development is a decision by every single one. To penetrate markets, customers need to buy and accept new technologies. In former times a car was a symbol for freedom, but is it nowadays predictable that it survives the technical change? Automobiles are of course not the only way to get from point A to B, but they will remain because of their strength in individuality of transportation.